When the holiday season rolls around, many social impact organizations tend to rely on tried and true strategies to pull in donations. But this is the time to try something new. As donors get bombarded with year-end asks, you need to stand out from the crowd. Here are five ways to give your holiday fundraising a lift that can help drive engagement and maximize results. During the holiday season, organizations often encourage donors to make a gift on behalf of someone they love. Make the giving experience even more special by leveraging eCards. Design holiday-themed cards that are branded to your organization, and allow donors to send one to the person they’ve dedicated their gift to. 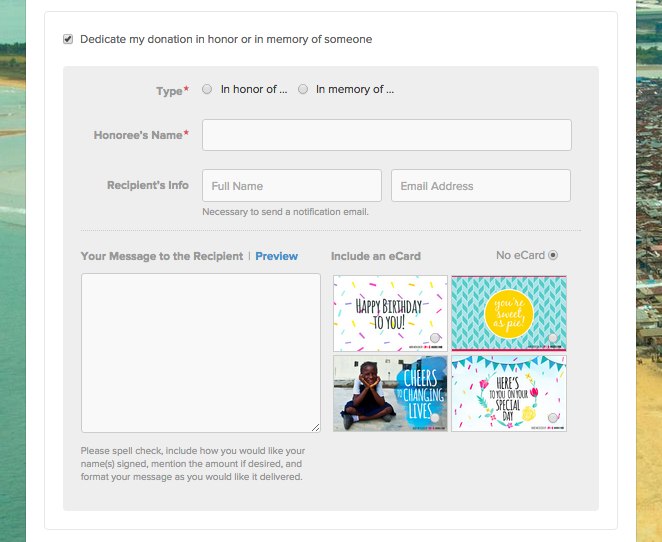 Check out the custom eCard options that More Than Me provides on their donation form. Keep in mind that eCards aren’t just for the holiday season either. You can update your eCard designs to fit other seasons, or you can offer more evergreen options for year-round occasions like birthdays or engagements. Because these eCards are stylized and branded, they end up being a much more unique and personalized alternative to the generic dedication email. This creates a more meaningful experience with your organization for both the supporter and the honoree. With all of the media attention surrounding #GivingTuesday, the national philanthropic event will be a major fundraising opportunity for all social impact organizations. According to certain estimates, #GivingTuesday 2014 raised $46 million, surpassing 2013’s $28 million tally. The annual event also generated 53 percent more donations in 2014 than 2013. The spike in numbers is setting the tone for a huge fundraising opportunity this #GivingTuesday. Organizations that are thinking ahead might plan a campaign just for #GivingTuesday. However, you can maximize your results even further by using it as a springboard for your greater year-end initiative. Instead of launching separate #GivingTuesday and holiday fundraising campaigns, simply integrate #GivingTuesday into your year-end campaign. The excitement around #GivingTuesday makes it the perfect day to officially raise awareness of and launch your bigger campaign. People will be excited and ready to donate, driving the initial progress that will set the tone for success. This early momentum can attract other donors throughout the month who want to be a part of your success story. Put a twist on holiday gift shopping by launching a catalog of “impact gifts” that supporters can purchase. 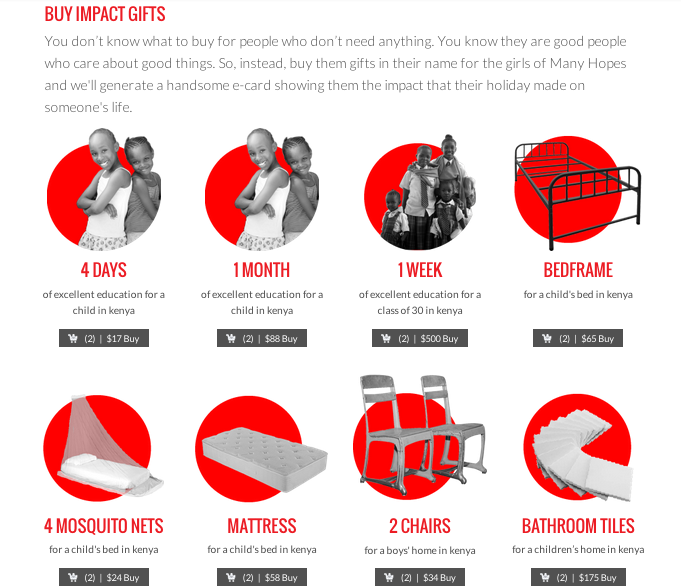 Itemize the difference that someone can make and pitch it as something they can “buy.” This makes the connection between gift amount and impact extra tangible for donors. Then encourage supporters to purchase meaningful gifts on behalf of those they love too. One excellent example comes from Many Hopes, an organization driving sustainable community development in Kenya. For their 2014 holiday efforts, they created a holiday catalog of impact gifts that supporters could buy. Note how each gift’s “price” and “buy” buttons—complete with the familiar shopping cart—makes you feel like you’re browsing a real catalog. The organization also created custom donation forms that tied each gift’s price to the giving levels on the appropriate form. For example, if you click to buy a $58 mattress, you land on a donation form whose suggested gift amounts vary depending on how many mattresses you want to put in your cart. Pro Tip: And remember those eCards? 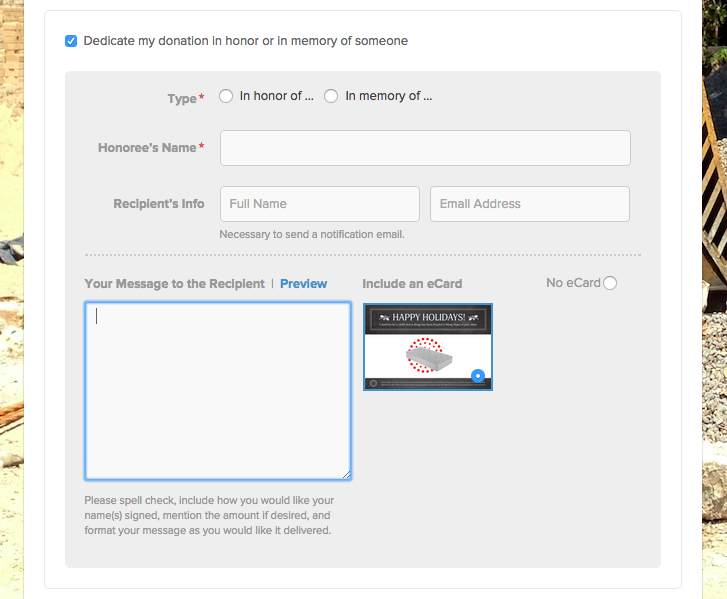 Consider creating one for each gift, so donors can let friends and family know what gift was made in their honor. That’s exactly what Many Hopes does here. Transform your year-end appeal into a visual experience. Instead of just listing numbers to convey your impact, turn these statistics into an eye-catching infographic. A visually appealing graphic like this can draw in readers as soon as they open your email, keeping them engaged and making your important information easy to digest. Take this example from Shining Hope for Communities (SHOFCO), an organization linking girls’ education to holistic social services. To demonstrate the results of their programs, they included this “impact dashboard” infographic in their year-end appeal. This is a great way to prove the effects of your work to supporters, and rally them to help you make an even greater difference this upcoming year. Quite the effective holiday fundraising trend, videos are a classic way to engage supporters. Not only are they a great way to connect donors to the people you serve, but they can also help supporters feel more connected to your organization. This holiday season consider creating a short thank-you video from staff members. This video can humanize your organization and remind supporters that there are real people behind your brand. Pull your team together to share the year’s greatest achievements, and personally thank supporters for their help in making your projects a success. Don’t be afraid to show off your staff’s personalities or quirks. These small touches can delight donors and create a positive emotional connection with your brand. With these holiday fundraising trends and tactics under your belt, you’ll be able to kick up your year-end efforts a couple notches. Whether you prepare eCards or film a staff video, think about how you can engage your fundraising community during the holiday season.